After a wait of more than 10 years, the Seaport community appears poised to get a Peck Slip Park plan that it likes. 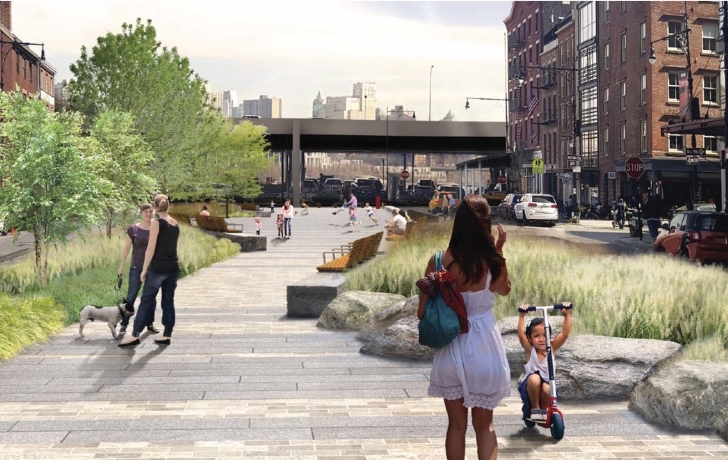 This month, city Parks Department officials and their designers revealed a reimagined look for the .65-acre stretch between South and Water Streets. The new design responds to the flexible, open space that many in the neighborhood said they wanted, and what the former parking lot has largely become over the years. The proposed plan comes after a previous proposal, on the drawing board since 2006, was roundly rejected at a public meeting last September as overly designed. That $4.3 million plan, to be paid for with federal post-9/11 recovery funds, was originally approved by Community Board 1 and city and state agencies. It included a stone plaza on one end marked by an outline of a boat with sculptural steel and wooden elements 11-to-16 feet long meant to suggest the ribs of a ship. But times and people change. Over years of delays (due to lengthy underground repairs, Superstorm Sandy and other factors) the Peck Slip School opened, more families moved in, and new cries for open space were heard. Now the nautical references are gone and the piazza look that many had asked for is in the plan. Shipley emphasized that the designers were heavily restricted by a sewer line that runs along the southern end of the site, with a 15-foot easement on either side that prevents plantings over two-thirds of the plaza. Some in the room voiced concerns about closing Front Street, which runs through the site, and its effect on traffic and deliveries for area businesses. CB1, in its resolution approving the plan, called on the city Department of Transportation to “propose additional traffic modifications” to relieve potential problems. The board also asked for an elevated stepped structure at the east end of the park to impede balls and children from going onto South Street. Construction is expected to begin in the summer or fall of next year and take a year to complete, according to a Parks Department official. Here are the main features of the proposed Peck Slip Park design, shown below. The designers are proposing a lighter granite paving that is meant to match “as closely as possible” the size and color of the existing cobblestone street but with a flatter block that makes it accessible for wheelchairs and people with canes. In between the pavings are irregular bands of darker granite. Where Front Street now runs through the park would be the lighter-colored, flat granite pavers. A foot-high curb and bollards would protect the site from vehicles. There will be plant beds with grasses and perennials on the north and south sides of the park but because of a sewer line, trees can only be planted on the north side. The sewer also limits shade trees on the east side; smaller trees will be planted on the west. The planting beds will be edged with stone benches on both sides, topped with wooden bench seats, similar to those now on the East River Esplanade. The shade trees will also have seating beneath them. Local merchants could put out their own tables and chairs, as they do now, to provide flexible seating.